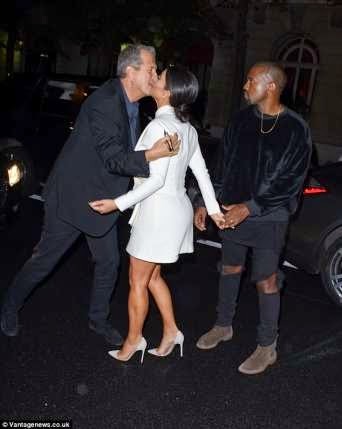 Kanye was holding his wife's hand while she received a huge kiss from photoghrapher, Mario Testino... how awkward! What in the world was Kim Kardashian thinking going mouth to mouth with a 'straight' white guy in front of her rapper beau, Kanye West! Apparently the paparazzi-friendly couple is presently in France with their daughter, North West, for the Paris Fashion Week but also create time for date nights. On one of those date nights, which was Wednesday, the couple bumped into famed photographer Mario Testino after attending the Balenciaga Paris Fashion Week show with their daughter... and that meeting was way awkward! In the course of trying to greet each other, Kim and Mario locked lips right in front of Kanye who looked awkwardly away. Its obvious the 33-year-old reality TV star - who looked stunning a white A.W.A.K.E ensamble - was aiming for a cheek salute but got a huge kiss in the presence of her 'ruthless' beau. We are sure the Yeezus star didn't say a word but he would definitely respond to that some day because that's what Kanye does! Meanwhile the couple was later joined by Kim's mother Kris Jenner and model sister, Kendall Jenner as they attended the Buro 24/7 Fashion Forward Initiative Presenting Natalia Alaverdian, Founder and Creative Director of A.W.A.K.E. at The Peninsula Hotel in Paris, France. What do you guys think of that kiss?